This is part two of a four part series on the wonders of video game cartridges. Start at the beginning by reading about lock-on cartridges. Last time, we took a look at three cartridges that had a little something extra: a cartridge slot of their own for other cartridges to get plugged into. A few other cartridges took that idea a step further, cramming separate video game consoles into the cartridge slots of their host consoles. These were no ordinary hardware add-ons: they required completely distinct and incompatible cartridges of their own. Today, we’re going to take a look at three very different consoles-in-cartridges from three very different companies. All of these companies had both technological and strategic reasons for coming into existence, and they all have an interesting story to tell. Let’s start with the most obscure one—the only unlicensed system in the set and the only one made by someone other than the console creator. Codemasters must’ve had quite an impressive research and development lab at their office back in the early 1990s. Originally founded to develop games for Commodore’s home computers, they’d branched out to creating unlicensed games and add-ons for the Nintendo Entertainment System (NES) within a few years. Their best-known product, at least for console gamers, is probably the Game Genie cheat device1, but that wasn’t their only piece of unlicensed NES hardware. One of the most amazing things about video game cartridges was how much flexibility they offered. As technology progressed, cartridges became increasingly powerful to augment the hardware within the consoles themselves. The NES hardware dated back to mid-1983, and by the early 90s it was in need of all the help it could get. Later NES cartridges contained a wide range of components inside them, including everything from RAM to bank switching memory controllers or custom hardware mappers2. Many cartridges for different games had identical hardware inside them, with the only difference being the game data stored within their ROM chips. Codemasters co-founder Richard Darling saw this and had the bright idea to create an add-on for the NES to make games simpler and less expensive. 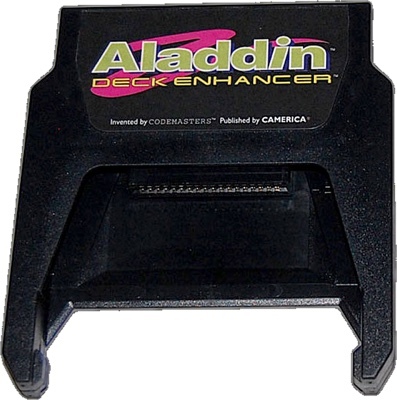 The Aladdin Deck Enhancer, released in November 1992, was the result. The Enhancer was an NES cartridge that contained everything except the game data, and it had a slot of its own for use with so-called Compact Cartridges. These Compact Cartridges would be much smaller than regular NES cartridges, and would consist solely of game data stored on ROM chips. 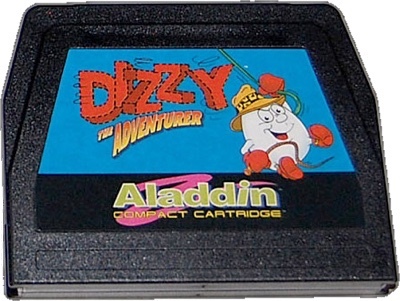 Dizzy the Adventurer on Compact Cartridge. Codemasters hoped that the Enhancer could become its own viable target platform for publishers who were interested in bypassing Nintendo’s official licensing program and releasing their games on Compact Cartridges instead. By virtue of their smaller physical size and the fact that much of the circuitry needed by ordinary cartridges was built right into the Enhancer, Compact Cartridges could be sold at a much lower price than regular licensed NES games. Given the fact that it was released after the successor to the NES was already on the market, it’s quite clear that the Enhancer was targeting budget-conscious consumers who were less interested in the latest gadgets and just wanted to play some games. Unfortunately for Codemasters, the idea never really took off. Despite promising that there would be twenty-four games on the market by the end of 1993, only seven games were ever released, and lots of unsold inventory sat around in warehouses for decades. Unbelievably, complete new-in-box hardware is still relatively easy to find online more than twenty-five years after release3. The Super Game Boy was an add-on for the Super Nintendo Entertainment System (Super NES) that gave it the somewhat astounding ability to play Game Boy games. Not much larger than a regular Super NES cartridge, the Super Game Boy had a slot on its top edge that could fit standard Game Boy games. Once players inserted a Game Boy game and put the Super Game Boy into their console, they’d find themselves able to play their favourite portable games on their television sets for the first time ever. Given that the Game Boy was notorious for having a grainy, blurry, and dim screen, this was a tremendous improvement. Although modern gamers are used to the idea of playing games for older systems on newer ones, the idea was still relatively novel in the early 90s4. Consoles in the 90s weren’t powerful enough to emulate other systems using software, so the Super Game Boy cartridge actually contains all of the internal hardware of a regular Game Boy within it. Despite being mostly just a Game Boy in a cartridge, the Super Game Boy had a few extra tricks up its sleeve. 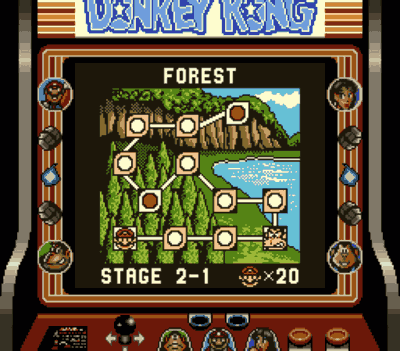 Donkey Kong on the Super Game Boy, showing its custom border. Super NES games were meant to be played on large television sets, rather than pocket-sized screens, which meant that they had a higher screen resolution than Game Boy games. This meant that when a Game Boy game was displayed on your television screen, its images would be inset by a border on all sides to make up the difference. Players could select from a variety of decorative borders that were built in, or they could make their own using virtual drawing tools. Players were also able to colourize the games they were playing, replacing the monochromatic shades of the Game Boy with a custom palette of their choosing. Some later Game Boy games came with custom borders built-in, and could also take advantage of the Super Game Boy hardware to display more in-game colours than usual5 Unfortunately for gamers, these sorts of enhancements never really caught on, but the ones that exist are fascinating6. The Super Game Boy was released in 1994, five years into the life cycle of the Game Boy and three years after the release of the Super NES. The Super Game Boy was a clever move for a number of reasons. First of all, it expanded the size of the game library available to Super NES owners tremendously, instantly making available more than three hundred additional games for them to play7. Secondly, it reflected some attention back toward the fading Game Boy, which was starting to seem a bit long-in-the-tooth by this point. Nintendo wouldn’t have to wait long before the Game Boy got its second wind: Pocket Monsters, the first Pokémon game, landed in Japan in 1996 and started a pop culture phenomenon, and by the end of the 1990s, Nintendo had released three additional variants of the Game Boy hardware8. Ultimately, the Game Boy line went on to become one of the best-selling video game systems of all time9. 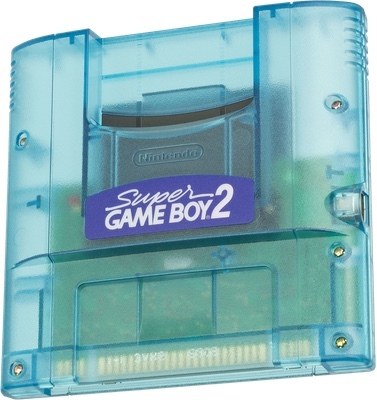 Japan saw the release of the Super Game Boy 2 in 1998, which updated the styling to match the “translucent plastic” fad of the late 90s and made a number of improvements. The original Super Game Boy didn’t quite match the CPU speed of the original portable console, and played games 2.4% faster as a result. The Super Game Boy 2 corrected this error, and it also added a Game Boy link cable port that allowed for head-to-head multiplayer action if players had a second console handy10. 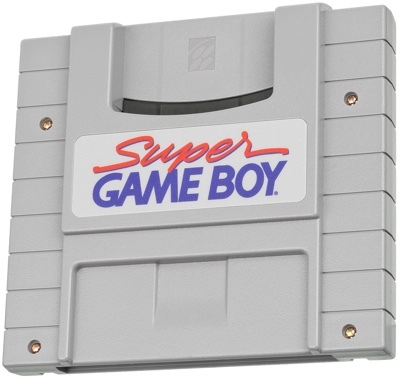 Overall, the Super Game Boy was probably the most successful console-in-a-cartridge. Nintendo would use the same basic idea in 2003 for the release of the Game Boy Player, which gave players the ability to play the Game Boy Advance, the Game Boy Color, and the original Game Boy games on the GameCube. 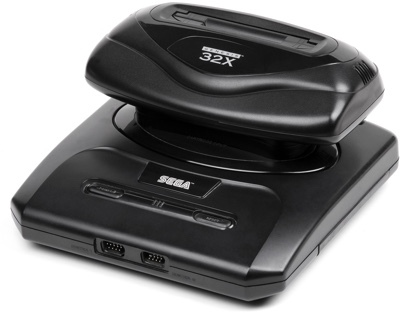 Of the three systems we’re looking at today, the Sega 32X looks the least like a traditional game cartridge. Slotting into the cartridge slot of the Sega Genesis, the 32X added substantial graphical horsepower to this increasingly underpowered system. It’s not hard to imagine that Sega’s industrial designers were trying to evoke the feel of a muscle car supercharger as they worked, especially given that the primary target demographic for the system was teenage boys11. Unlike the other systems we’ve discussed, the 32X wasn’t a simple plug-and-play experience. Before connecting the 32X, gamers had to install a piece of metal inside of the Genesis. Next, they had to connect the 32X to their television (instead of the Genesis) and then connect the 32X back to the Genesis with a second video cable. Finally, the 32X had a power supply of its own, complete with a bulky transformer box on the wall side. Once things were all set up, the rear of the Genesis/32X combination was a mess of cables12. Released in 1994, the 32X came out more than five years after the original release of the Genesis, which at the time was facing increasing pressure from both Nintendo and new challengers with fancy next generation consoles. Although Sega’s own next-generation console was nearly ready for release, it would come with a next-generation price tag, too, hitting shelves at more than four times the cost of the current price of the Sega Genesis13. Sega was hoping that there was a huge potential market of consumers who might be willing to shell out a comparatively small amount of money to get a bit closer to next generation gaming14 and this strategy seemed like it might have worked. However, the day after the Sega 32X launched in North America, Sega’s real next-generation console, the Saturn, launched in Japan. 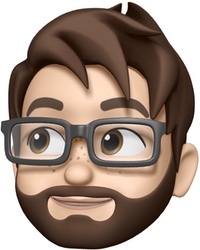 Trying to attract developer support for two new systems at the same time was a tall order, and consumer demand for a half step toward the next generation when a full step was right around the corner fell with each passing day. This put pressure on Sega to get the Saturn out in North America earlier than expected, with a surprise release just six months after the 32X. It was a disaster. And yet, it’s not too hard to imagine a world where the 32X had been successful. If the 32X had been released a bit earlier, or if the Saturn had been released a bit later, the 32X might’ve had enough time to catch on15. Even including the cost of a new Genesis, the 32X still cost half as much as the Saturn, and it had a lot to offer gamers in terms of hardware advancements. Unfortunately, rather than setting the stage for Sega’s future successes, the 32X foreshadowed Sega’s eventual exit from console development entirely. Cartridge slots were meant for games, not systems, but intrepid engineers pushed the limits and built some impressive things for them anyway. The move from cartridges to optical discs, and ultimately to digital downloads, means that the cartridge slot’s day has come and gone. Hardware add-ons are still a going concern in the contemporary gaming industry—look at the Sony’s PlayStation VR for a recent example—but the challenges haven’t changed. Add-ons are always a gamble: their total addressable market is capped by the existing installed base for the original system, and gamers are often eyeing the next big thing by the time an add-on comes to market. Most fail to make much of an impact. But, they can work, given a compelling enough value proposition—the success of the Super Game Boy is proof enough. Many thanks to my patient and helpful wife, Nathalie, for copyediting this article. Want to hear about the next article when it's published? Sign up for a one-time notification here—no spam or recurring emails, I promise.